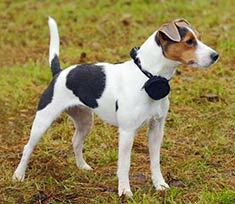 The Parson Russell Terrier is a tough, small, medium-boned dog whose long legs help make it good at hunting small animals. Its slender body enables it to fit into the tiny places its quarry might try to hide. The JRT has a free and lively gait, and has a keen, alive expression. This dog breed also makes an excellent human companion and is especially active with children. The Parson Russell Terrier originated in Great Britain. Parson Russell Terriers range from 10 inches to 15 inches. Parson Russell Terriers range from 13 to 17 pounds. Parson Russell Terriers are white, white with black or tan markings or a combination of these colors. Parson Russell Terriers have a double coat with a short, dense undercoat and a smooth, broken or rough outercoat. Grooming requirements are minimal. The Parson Russell Terrier is a self-assured and loyal dog who takes well to training. While hunting this dog breed is alert and courageous, but at home the Parson Russell Terrier is affectionate and playful. The Parson Russell Terrier is usually a healthy dog, but could be susceptible to eye problems and dislocated kneecaps. The expected life span of the Parson Russell Terrier is 13 to 15 years. Parson Russell Terriers will do well in a house with a fenced yard or in an apartment if exercised daily. The Parson Russell Terrier is in the Miscellaneous group. 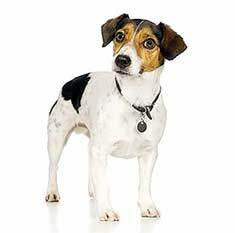 If you have young children, you are no doubt well aware of the Jack Russell Terrier, as it is featured on the "Wishbone" television series. Even if you don't have kids, you've seen the Jack Russell featured on "Frasier", "Malcolm in the Middle", or the series of movies "Honey, I Shrunk…" And if you're old enough to have great-grandchildren, you will recognize the Jack Russell as the dog looking into the RCA Victrola, trying to find out where the sound was coming from. These spunky little dogs are very playful, leading to their popularity with so many directors, as well as with dog owners the world over. The Jack Russell Terrier is small and mostly white, with a smooth, broken, or rough coat. Originally bred for fox hunting, the most distinctive feature of the dog is its chest circumference. The small chest size of the Jack Russell helps to distinguish it from the Parson Russell Terrier and the Russell Terrier which may look very similar. The Jack Russell must be able to chase its prey into the fox' den. Most foxes have a chest size of about 12 - 14 inches, so the dog must have the same or smaller. Foxes may choose to hide in rabbit holes, groundhog dens, or even drain pipes, and the dog wants to go right in after them. The nature of the work results in some traits that may not make adoptive families very happy in a pet. The dogs were bred to bark so that they, and the fox, could be located underground. They also have to be prodigious diggers to burrow in wherever the fox is. Translated to the pet world, this means your yard will be forever dug up and your neighbors may complain about excessive barking. However, those who live with Jack Russells don't seem to mind. One former guardian states "It is like he was my first child. I miss him so much. I would mortgage my house for another dog just like him." Good thing that Jacks normally live between 11 and 18 years, so we can enjoy them for a long time. To meet the breed standard for a Jack Russell, the dog must be at least 51% white, with black and or tan markings, most commonly on the face and at the base of the tail. There is freckling on the skin and undercoat, but these black or brown spots do not carry through to the outer coat. A smooth coated dog's topcoat is less than a ½-inch long and very dense, while a rough coated dog has fur as long as 2.5 inches. Broken coat can mean one of two things: either the dog's outercoat lies somewhere between .5 and 2.5 inches, or the dog has fur that is long on some parts of his body and fur that is short on other parts. If you're wondering about the name of the breed, as well as its similarity to the Russell Terrier, and the Parson Russell Terrier, a bit of history may be in order. The Reverend John Russell was a parson in England in the early 1800's. Throughout his life, he worked to develop a terrier with the high stamina and courage to chase after foxes but without the aggressiveness that would result in physical harm to the fox. His dogs were simply called fox terriers. However, the kennel clubs decided they needed to separate the small working terriers from the larger, non-working fox terriers in order to develop a clearer breed standard. 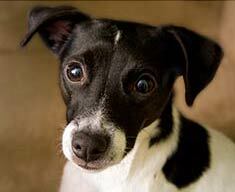 The smaller variety was called the Jack Russell Terrier in honor of the Reverend John Russell. As time passed, what used to be called a fox terrier became called a Parson Russell Terrier, in a tip of the hat to the Reverend. The FCI, a federation of canine associations headquartered in Belgium, has a breed standard for the Russell terrier, also known as the Australian Jack Russell. This dog is described as a principally white-bodied terrier 10" to 12" tall at the withers with a distinctly different silhouette than the working Jack Russell terrier or Parson Russell Terrier. Although neither the United States nor the United Kingdom's Kennel Clubs are part of the FCI, both recognize the breed as separate from the AKC Parson Russell Terrier, the JRTCA (Jack Russell Terrier Club of America) Jack Russell Terrier, and the UKC Jack Russell Terrier. The Jack Russell is very independent. Don't let his small size fool you - he is no lapdog! He gets bored easily and may even be described as moody if not regularly exercised. The breed is known for its swimming ability, even underwater! This dog packs an amazing amount of high energy and must be kept busy most of the time to avoid undesirable behavior. One story on the JRTCA website even suggests that Jack Russells be placed with those who need daily physical therapy because the dog is so active, it keeps the person active, as well! Like most small dogs, Jack Russells often have a "Napoleon complex", not realizing that they are much smaller than the other dogs in the neighborhood. Jack Russells may be able to scare off the larger dogs with their ferocious barking, but those dogs that aren't put off by that may give the terrier more fight than he bargained for. If a Jack Russell is introduced to a new dog, be ready for a fight. Unless another dog is raised with the Jack Russell, the Jack is likely to treat the new dog viciously. In New Zealand recently, a Jack Russell Terrier saved five children from an attack by two pit bulls. The dog had to be put down after the fight because of injuries sustained in the line of duty, but he was awarded the medal of bravery by the SPCA, an award normally given only to humans. In addition, a United States Marine veteran of Vietnam, donated his Purple Heart to the dog's guardian, in honor of the dog's injuries sustained in battle. If you are looking to bring a Jack Russell into your home, you must be prepared for their high activity needs. Jacks are often given up even before their first birthday, simply because the family was not prepared for this type of dog. The Jack Russell can be good with children, if the children are good with him. He will not tolerate abuse of any form, so if you have tail-pulling toddlers, you may want to wait awhile before adding a Jack Russell to your home. When you are ready for an independent dog that will encourage you to keep up with him, consider adopting an older dog from a shelter, where many Jack Russells end up due to ignorance of the breed. Find Parson Russell Terrier Puppies with our Free Breeder search!